Take a journey up through our building and see if you can spot the A-Z of key dance words located around the foyer spaces. Look on walls, pillars and even the floor. As you go up the main staircase, look out for the quotes from the Sampled choreographers on why they love dance. Enjoy these short dance films from the next generation of choreographers. Sadler’s Wells has partnered with Random Acts to create original films from three distinctive dance artists: Botis Seva, Julie Cunningham & Alesandra Seutin. You’ve heard from the experts, now is your chance to tell us why you love dance on our chalkboard. In counterpoint to five large spray paint panels, two dancers perform a durational performance that challenges dancers with complex perceptual puzzles. A second, more mobile version of Singular will travel throughout the Sadler’s Wells foyers. Experience this hypnotic, kaleidoscopic dance installation which is always in motion. After the curtain has come down, come to the mezzanine for Dance Club and join a community of people who just love to dance! Founded by Mariana Lucia Marquez and Nikhil Shah, Dance Club is a dance experience that is at the intersection between a club night, a dance class and a dance show. Along with dancers and a DJ, come and unleash your creativity, experiment with new moves, and join the movement on the dance floor! Brought to you by Breakin’ Convention, Freestyle Funk Forum is hip hop’s answer to 'Whose Line Is It Anyway?' Featuring four dancers, a beatboxer and live music, no two shows are ever the same in this spontaneous collection of skits brought to life through the elements of hip hop from dance and beatboxing to turntablism and rap. Get here early to enjoy the proper Breakin’ Convention experience..
Battle the greatest lyricists using… the contents of your pocket! Pull out the most unexpected items and be amazed as our eloquent MCs find ways to rhyme with just about anything you give them! Close off your evening with a social dancing session led by Breakin' Convention. Follow the leader and learn new steps, grab a partner or make new friends as the mezzanine is turned into a social dance club. 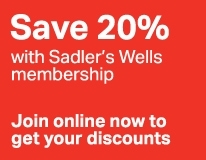 The Sadler's Wells Sampled workshops are a great opportunity to learn moves by some of the world's leading dancers and dance makers. They are open to all levels of ability ages 16+, unless otherwise specified and cost £5 each. A transaction fee applies: £3 for telephone bookings, online and concessionary bookings. There is no charge in person at Ticket Office. Richard Alston Dance Company is a world-renowned London based contemporary dance company that performs ‘inspirational and beautiful work’. Taught by senior dancer Elly Braund this workshop will let you discover the dance language of the company. Alston is well known for his instinctive musicality and for developing a unique and distinct dance style that has shaped the art form in the UK. Led by acclaimed international soloist, Mavin Khoo this workshop will provide you with an introduction to some of the stylistic features of some of the Indian classical dance forms. A combination of footwork, rhythms, music and facial expressions will be explored to give an insight. BirdGang Ltd is a leading UK creative company that creates, teaches and distributes original dance content. Leaders in hip hop theatre, BirdGang Ltd are known for their high quality content, performances and education programme. The BirdGang style has influences from a lot of different dance styles such as Popping, House, Breaking & Contemporary. Taught by Chaldon Williams, this workshop will teach you the foundations in hip hop dance and will demonstrate how you can develop your own style of movement rooted in hip hop theatre. Offering courses all over the world, Patricia focuses on improvisation and choreography within flamenco. She pays tribute to the traditional style from Granada, adding a personal touch with her flawless technique, elegance and pellizcos. In this intensive workshop, flamenco dancers of all levels will get the chance to study one of the secrets behind her beautiful style: physical strength combined with refined, subtle movements. An energetic and interactive dance workshop led by Uchenna Dance, exploring the company’s unique blend of House, Waacking and Vogue, fused with African and contemporary dance. Uchenna Dance’s mission is to empower, entertain and educate through dance. Semperoper Ballett are a world-renowned ballet company from Dresden. Their dancers are famous for their versatility, astonishing technique and virtuosic expression. Taught by Ballet Master Raphaël Coumes-Marquet, this exciting workshop will let you discover the repertoire of the company, work on composition techniques and explore the ways their dancers work.